I just finished reading the book Now, Discover Your Strengths by Marcus Buckingham and the late Donald O. Clifton, Ph.D.
We wrote this book to start a revolution, the strengths revolution. At the heart of this revolution is a simple decree: The great organization must not only accommodate the fact that each employee is different, it must capitalize on these differences. It must watch for clues to each employee’s natural talents and then position and develops each employee so that his or her talents are transformed into bona fide strengths. By changing the way it selects, measures, develops, and channels the careers of its people, this revolutionary organization must build its entire enterprise around the strengths of each person. And as it does, this revolutionary organization will be positioned to dramatically outperform its peers…To break out of this weakness spiral and to launch the strengths revolution in your own organization, you must change your assumptions about people. Start with the right assumptions, and everything else that follows from them—how you select, measure, train, and develop your people—will be right. These are the two assumptions that guide the world’s best managers: 1. Each person’s talents are enduring and unique. 2. Each person’s greatest room for growth is in the areas of his or her greatest strength. These two assumptions are the foundation for everything they do with and for their people. These two assumptions explain why great managers are careful to look for talent in every role, why they focus people’s performances on outcomes rather than forcing them into a stylistic mold, why they disobey the Golden Rule and treat each employee differently, and why they spend the most time with their best people. In short, these two assumptions explain why the world’s best managers break all the rules of conventional management wisdom. Now, following the great managers’ lead, it is time to change the rules. These two revolutionary assumptions must serve as the central tenets for a new way of working. They are the tenets for a new organization, a stronger organization, an organization designed to reveal and stretch the strengths of each employee. For the sake of clarity let’s be more precise about what we mean by a “strength.” The definition of a strength that we will use throughout this book is quite specific: consistent near perfect performance in an activity. By this definition Pam’s accurate decision-making and ability to rally people around her organization’s common purpose are strengths. Sherie’s love of diagnosing and treating skin diseases is a strength. Paula’s ability to generate and then refine article ideas that fit her magazine’s identity is a strength. Skills bring structure to experiential knowledge. What does this mean? It means that, whatever the activity, at some point a smart person will sit back and formalize all the accumulated knowledge into a sequence of steps that, if followed, will lead to performance—not necessarily great performance but acceptable performance nonetheless…The bottom fine on skills is this: A skill is designed to make the secrets of the best easily transferable. If you learn a skill, it will help you get a little better, but it will not cover for a lack of talent. Instead, as you build your strengths, skills will actually prove most valuable when they are combined with genuine talent. What is talent? Talent is often described as “a special natural ability or aptitude,” but for the purposes of strength building we suggest a more precise and comprehensive definition, which is derived from our studies of great managers. Talent is any recurring pattern of thought, feeling, or behavior that can be productively applied. Thus, if you are instinctively inquisitive, this is a talent. If you are competitive, this is a talent. If you are charming, this is a talent. If you are persistent, this is a talent. If you are responsible, this is a talent. Any recurring pattern of thought, feeling, or behavior is a talent if this pattern can be productively applied…Spontaneous reactions, yearnings, rapid learning, and satisfactions will all help you detect the traces of your talents. As you rush through your busy life, try to step back, quiet the wind whipping past your ears, and listen for these clues. They will help you zero in on your talents. Talents are your naturally recurring patterns of thought, feeling, or behavior. Your various themes of talent are what the StrengthsFinder Profile actually measures. Knowledge consists of the facts and lessons learned. Skills are the steps of an activity. On whether you can develop new themes if you don’t like the ones revealed? You may not be able to rewire your brain, but by acquiring new knowledge and skills you can redirect your life. You can’t develop new themes, but you can develop new strengths. On what to do about weaknesses? To begin with, you need to know what a weakness is. Our definition of a weakness is anything that gets in the way of excellent performance. To some this may seem to be an obvious definition, but before skipping past it, bear in mind that it is not the definition of weakness that most of us would use. Most of us would probably side with Webster’s and the Oxford English Dictionary and define a weakness as “an area where we lack proficiency.” As you strive to build your life around your strengths, we advise you to steer clear of this definition for one very practical reason: Like all of us, you have countless areas where you lack proficiency, but most of them are simply not worth bothering about. Why? Because they don’t get in the way of excellent performance. They are irrelevant. They don’t need to be managed at all, just ignored…So once you know you have a genuine weakness on your hands, a deficiency that actually gets in the way of excellent performance, how can you best deal with it? The first thing you have to do is identify whether the weakness is a skills weakness, a knowledge weakness, or a talent weakness. On whether the themes revealed will indicate whether you are in the right career? Our research into human strengths does not support the extreme, and extremely misleading, assertion that “you can play any role you set your mind to,” but it does lead us to this truth: Whatever you set your mind to, you will he most successful when you craft your role to play to your signature talents most of the time. We hope that by highlighting your signature themes we can help you craft such a role. Since each person’s talents are enduring, you should spend a great deal of time and money selecting people properly in the first place…Since each person’s talents are unique, you should focus performance by legislating outcomes rather than forcing each person into a stylistic mold…Since the greatest room for each person’s growth is in the areas of his greatest strength, you should focus your training time and money on educating him about his strengths and figuring out ways to build on these strengths rather than on remedially trying to plug his “skill gaps.”…Lastly, since the greatest room for each person’s growth lies in his areas of greatest strength, you should devise ways to help each person grow his career without necessarily promoting him up the corporate ladder and out of his areas of strength. Needless to say the individual manager will always be a critical catalyst in transforming each employee’s talents into bona fide strengths; consequently, much of the responsibility will lie with the manager to develop each employee’s career. If you want to keep a talented employee, show him not just that you care about him, not just that you will help him grow, but, more important, that you know him, that in the truest sense of the word you recognize him (or, at the very least, that you are trying to). In today’s increasingly anonymous and transient working world, your organization’s inquisitiveness about the strengths of its employees will set your organization apart. With the knowledge economy gathering pace, global competition increasing, new technologies quickly commoditized, and the workforce aging, the right employees are becoming more precious with each passing year. Those of us who lead great organizations must become more sophisticated and more efficient when it comes to capitalizing on our people. We must find the best fit possible of people’s strengths and the roles we are asking them to play at work. Only then will we be as strong as we should be. Only then will we win. This book includes access for you to take the online StrengthsFinder assessment and discover your top five themes. The material in the book will help you further develop your talents and strengths as well as how to best enable others on your team based on their strengths. A recommended read, development and engagement tool both from a personal and management perspective. I recently finished reading The Power of Full Engagement – Managing Energy, Not Time, Is the Key to High Performance and Personal Renewal – by Jim Loehr and Tony Schwartz. 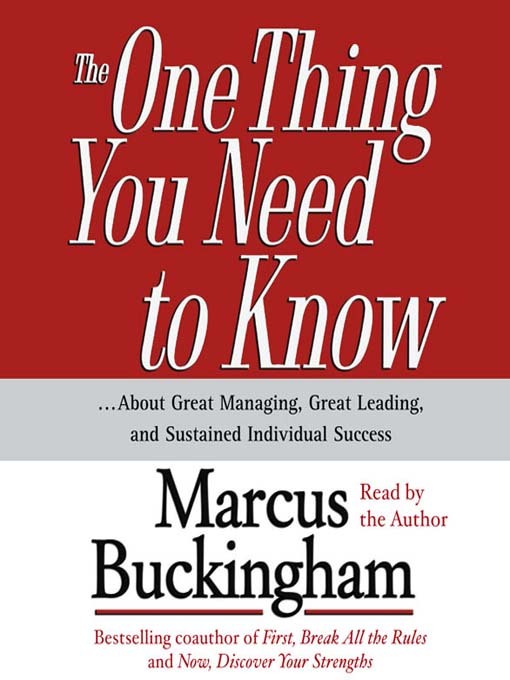 I recently finished reading The One Thing You Need to Know About Great Managing, Great Leading, and Sustained Individual Success by Marcus Buckingham.